It has been nearly 30 years since Indiana has defeated a top-10 team. Whether or not you think Nebraska merits its current ranking, you can bet the Hoosiers would be happy to hang that pelt on the wall and end the streak anyway. The last time Indiana did it was Oct. 10, 1987 at Ohio State. The 3-1 Hoosiers, led by former Buckeye coach Bill Mallory, went into Ohio Stadium and beat the 3-0-1 Buckeyes for the first time since 1951. Ohio State head coach Earle Bruce called it the “darkest day in Ohio State football” during his tenure. It was kind of a big deal. The history between the Huskers and Hoosiers isn’t nearly as long, but the stakes on Saturday feel plenty high. THE LINE: Lotta movement. This game opened with Nebraska favored by 7 or 8 points and it was down to the Huskers -3.5 on Wednesday ahead of the game. That is due at least in part to some injury news both ways, but thepredictiontracker.com average is still up around the opening line with Nebraska picked by an average of 6.57 points. THE RANKINGS: Not a ton of change for the Huskers after a bye week. FEI, based on drive efficiency, still likes Nebraska the most and that’s the ranking where Indiana fares the worst. The other four rankings we typically track have this one as a closer match up. Here are six stats that should tell a good portion of the story in Saturday’s Nebraska-Indiana game. Nebraska’s defense has made overall gains in 2016 by being better against the pass, and that’s come with some decreased efficiency against the run. That’s a tradeoff the Huskers are willing to make, but if there was a game for a vintage 2015 performance in run defense, Saturday is it. Last year Nebraska held teams to an average of 3.77 yards per carry and was 4-0 when holding opponents under 4 yards a carry. This season the Huskers are giving up 4.83 yards per carry and haven’t held an opponent under 4 since the Fresno State game. That number could be big on Saturday. The first thing people think of when they think of an Indiana offense is a high-flying aerial attack. The Hoosiers have led the Big Ten in passing in three of the previous four seasons and lead the conference again this season. But in recent years Indiana, spurred by a surprisingly good offensive line and a couple of dynamic backs, has become a load to handle on the ground, too. That’s the interesting thing about this 2016 team: Indiana is averaging just 3.86 yards per carry, its lowest average of the Kevin Wilson era. The Hoosiers rank 108th nationally in rushing plays of 10-plus yards and 118th in ground gains of 20-plus yards. It’s just not a very explosive ground game at the moment and the teams that have beaten Indiana this season — Wake Forest and Ohio State — have kept it boxed in. There is still plenty to worry about in the passing game, but taking away the Hoosiers’ balance has been a proven path to victory in 2016. It wasn’t a surprise yesterday when both defensive coordinator Mark Banker and defensive backs coach Brian Stewart mentioned the importance of stopping the run on Saturday. If the Huskers can keep Indiana under 4 yards per carry, they should be in decent shape. This is the sixth six-pack preview this season, and it feels like each one has mentioned the importance of finishing drives in one way or another. The logic behind that is pretty simple: It’s not about yards (or turnovers or explosive plays or staying on schedule), ma’am, it’s about points. Ultimately, that is. All of that other stuff matters in terms of maximizing scoring opportunities, but if you want to just keep score the traditional way it can’t be trumped. That said, it may not be an exaggeration to say that Saturday’s game will be decided on the Huskers’ half of the field. Indiana has been good at moving the ball and bad at maximizing the scoring opportunities it has earned. According to Football Study Hall’s numbers, the Hoosiers have scored 3.69 points per trip inside the 40, which ranks 121st nationally. In the red zone things have been even worse. Indiana has converted just 66.7 percent of its red zone trips into points, 124th nationally. Meanwhile Nebraska’s defense ranks 15th nationally by giving up 3.38 points per scoring opportunity and one in four opponent red zone trips have resulted in no points, 25th nationally. The Huskers numbers here are boosted a little bit by shoddy kicking. Nebraska has benefitted from four missed field goals this season, tied for the third-most nationally. Best not to count on that when facing the reigning Big Ten Kicker of the Year Griffin Oakes, even though he has missed four of 10 field goal attempts this season. I wouldn’t bet on that trend continuing. But what about the points? Is that going to play out on Saturday as it has for both teams so far in 2016? If it does, that’s good news for Nebraska. Given some of the injuries, I’m a little uncertain of what to expect from the Huskers’ offense, so I’m setting the bar pretty high here. Nebraska will need some stops in its own territory. We have already covered Indiana’s lack of explosiveness in the run game. Nebraska doesn’t have a ton either, but the passing game, both ways, is a different story. The Huskers currently rank 16th in passing at 8.8 yards per attempt. Indiana’s offense is even better at 9.3 yards per pass attempt (11th nationally). Where this match up gets interesting is when you factor in the defense. Nebraska has done a good job of addressing its Achilles’ heel from 2015 and is allowing just 6.1 yards per attempt (25th). Indiana’s not far behind at 6.3 (33rd), but there is a key difference. The Hoosiers are a little more attacking against the pass. They rank second in the Big Ten with 33 passes defended and are holding teams to 52.5 percent passing. That’s all great news when Indiana gets to the ball. When it doesn’t, it tends to get beat long. The Hoosiers’ 12.1 yards per completion ranks 61st. Not terrible, but a significant drop from the per-attempt average. That’s not the case with Nebraska. Teams are completing 58.5 percent of their passes against the Huskers, but Nebraska is doing a good job of keeping things in front of them at 10.5 yards per completion (13th nationally). With both teams at full strength, Nebraska’s defense appears to have the edge here but the Huskers aren’t at full strength offensively. Cethan Carter and Jordan Westerkamp are out. Alonzo Moore could play but it probably won’t be at 100 percent. If one of Indiana’s greatest vulnerabilities is the deep ball, who is going to step up for Nebraska and make those catches or those runs that turn short grabs into long gains? 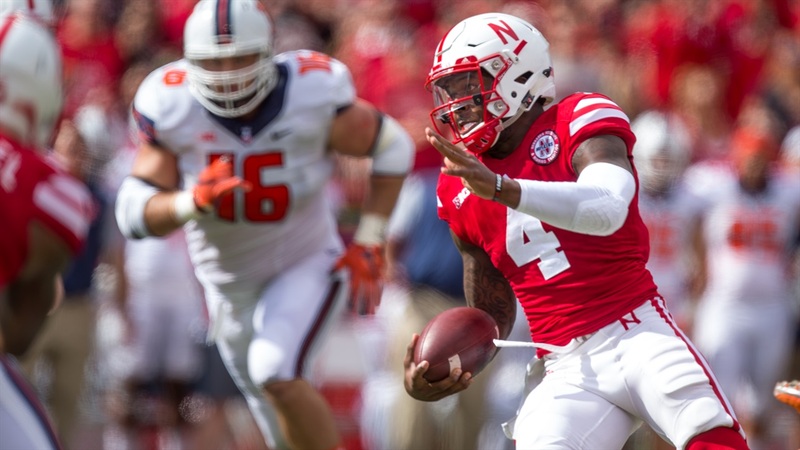 Tommy Armstrong Jr.’s YPC: The senior quarterback said Monday he probably wouldn’t have played if Nebraska had a game last Saturday. How close is he to full strength? That will be big because Ohio State quarterback J.T. Barrett torched the Hoosiers last week for 137 yards and a touchdown on a career-high 26 carries. Nebraska is going to need Tommy Armstrong to be Tommy Armstrong in this game and, so far this season, that has been about 11 true rushing attempts for close to 5.5 yards per carry. DPE: De’Mornay Pierson-El is only averaging 1.2 punt returns per game this season, but his 14-yard average ranks second in the Big Ten and he’s had two big, game-swinging returns in 2016. Indiana is a good punt coverage team. The Hoosiers have had one punt blocked and returned for a touchdown this season, but beyond that Indiana is allowing just 4.22 yards per return (second in the Big Ten). This likely isn’t a game where Nebraska wants to put itself in a position to need a spark from Pierson-El. He’s good enough to provide it anyway, but Indiana has been very good at limiting the damage there. Passing Downs: There are a lot of similarities between Nebraska and Indiana’s offenses and one of them is that both have been pretty good when behind the chains. A key difference, however, is that Nebraska has remained efficient while on schedule, which is less true for Indiana. The Huskers might need to test that. Indiana enters with a 47.2 percent success rate on standard downs, which is about average. If Nebraska can hold the Hoosiers under that, it makes those passing downs more frequent and more dangerous. Particularly on third down where Indiana ranks 85th nationally with a 37.33 percent conversion rate.